Following the recent IPCC report which states that we have just 12 years to stop the planet sinking into an irreversibly hostile place, Extinction Rebellion are on a mission to engage the public, hold our government to account, and change the conversation surrounding climate change. Hate spoke to activists Teddy and Nils about what to do next. 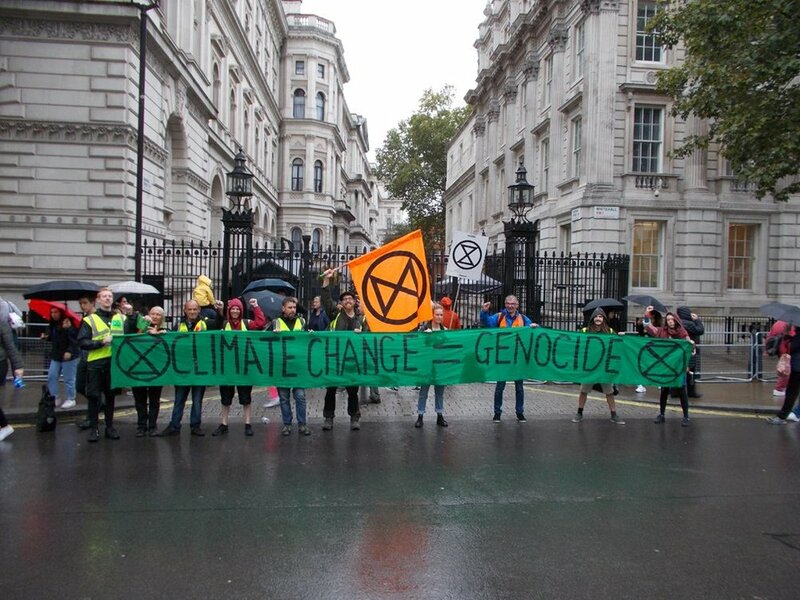 What is Extinction Rebellion’s desired outcome for the rebellion, and what form will this take? Teddy: Our aims for the outcome of this rebellion are threefold. Firstly, the government and media must communicate exactly how dire the situation is, and give clear, solid guidance on what needs to be done in all areas of society to make a significant impact on reducing our continual damage to the environmental state of our planet. Second, it must enact legally binding policies to reduce carbon emission to net zero by 2025. It has already been proven to us through the three years of insufficient action since the Paris Agreement, that good guidelines won’t keep our coastal cities above water. The government must cooperate internationally on these policies, and they must ensure they are carried out in full. We are on the brink, but there are changes that can be made to make our world and lives, better. Lastly, we demand a Citizens Assembly to oversee the changes that are necessary for such a drastic shift in our global culture. We do not trust our Government to make the bold, long-term changes that are required to stabilise our planet, with their current level of accountability to the people. It’s time for the Government to truly serve the people – it’s time for our representatives to act for the good of the many, rather than creating a world for us in which the many cater to provide luxury for the few, and are repaid with a burning world in which our families are drowned in a rising ocean. How can ordinary people, who might not have time to spare, get involved in the campaign? Teddy: Each individual is different and lives a nuanced life. Taking this into account, there is no one single way to be involved. The best place to start is to reach out. Send us a message on any of our media platforms. We are not a corporation. We have no product to sell. What we are is a group of concerned, passionate people. If you are also scared shitless about the ecological crisis and are desperate for change, even if you’re not sure what that would look like – hurrah! You’re part of the campaign. Share articles, like our posts, if you have time for nothing else, talk about what’s going on. The first way we change the world is by changing how we talk about it. We need climate change, it’s consequences, and proposed solutions, to be everyday topics among normal people. A lot of people find it hard to engage with climate change because it’s so intangible. What do you say to people who think it’s too late to do anything? Teddy: We could point you towards scientific papers that indicate this or that, but the one entire truth is that no one knows for certain what will happen. I am not sure that it’s not too late. But the one way to make sure no solution is found, is to not look for one. When I was faced with the realisation that maybe I will never raise a family, or grow old, that maybe my sister’s unborn child will never live to be my age, I knew that I could not stand on the side-lines of this struggle. How could I look into the eyes of that child - due to be born on the day of our Declaration of Rebellion – with the knowledge that by my inaction, I am killing her? Will you be able to look into the eyes of those you love, and know you did everything you could to protect them? What daily actions can people take that will have a positive effect in the fight against climate change? Teddy: Buy local veg – this reduces Co2 produced for shipping, and often the veg is nicer and better for you too. Don’t support companies and corporations that have stakes in oil and fracking. Don’t give them the money with which to damage our planet. Get out into sunlight and nature more. Mental health in Western society is atrocious, and we cannot live the most sustainable lives possible when we can’t even take care of ourselves. This is a holistic problem, and the solution must be too. The things that keep people healthy, go hand in hand with those that keep the environment healthy. 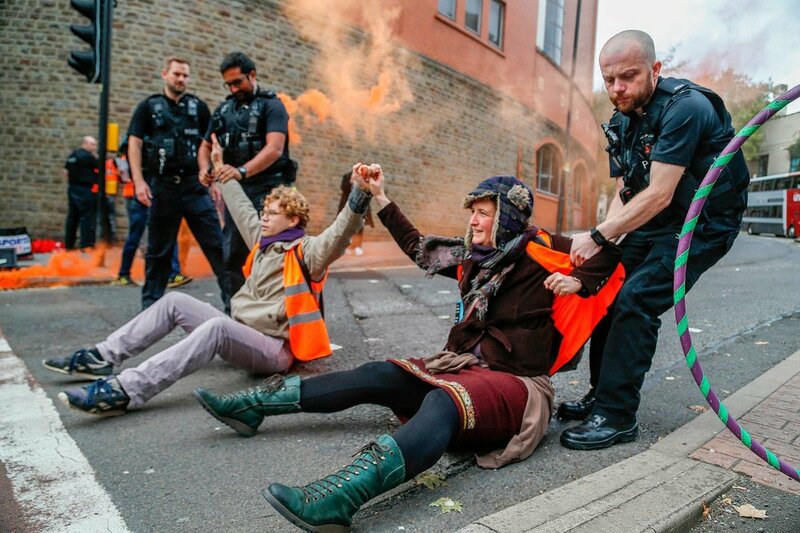 XR has hosted workshops about getting arrested and potentially going to prison in defence of the cause. Can you explain more about this tactic? Nils: Public displays of sacrifice such as arrests and imprisonments have proven to be an effective way of bringing about change. Humans are emotional creatures and presenting people with pure facts usually doesn’t stir anyone to action in support of the greater good. However when you see a person who looks like you, who comes from the same part of society as you are and who is making a sacrifice in public for a cause such as getting arrested, then your emotional reactions mobilise you in support of the cause. Simply telling people the facts about the ecological crisis won’t get the point across, for that we need to make sacrifices. We need to tell truth and act according to as if that truth were real. In regards to the recent ‘disco roadblock’ action in Bristol, where protesters held up traffic in the city centre, how effective is this kind of action in engaging the general public? Realistically, how can we hold governments and big corporations to account, whilst living within a society that relies upon them? Since learning about climate change I have been horrified and afraid. On a personal level, how do you reconcile yourself with such emotions? Nils: It is a massive thing and personally I have been processing the realisation that it might be too late for things to work out all right. As a network we are making the space for grief, it is a natural thing and something we need to learn how to live with and process, both as individuals and as a movement. The time for hope is over and indeed that is what might turn things around. It is a bit like realising you are going to die, which we all are eventually in one way or another. I can see the beauty of life in a way I could never have done before and what is important. We might still have a chance to make the upcoming catastrophe less bad and even though that chance is diminishing day by day, it would still be the right thing to do to seize on it and set our sight on what is necessary. For more information on how to get involved in the fight against climate change, follow Extinction Rebellion on instagram or facebook.